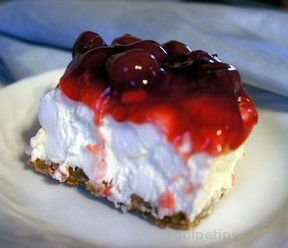 Sweet and delicious yet simple to make. 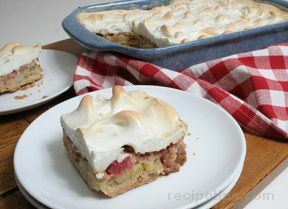 The ingredients are simply layered over the rhubarb and baked. 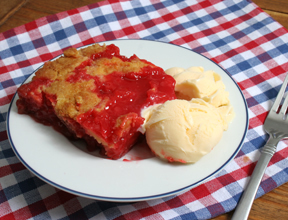 It is sure to be one of your favorite desserts during rhubarb season. 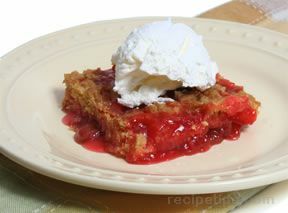 Dice the 4 cups of rhubarb and place in an 8" X 8" greased pan. Sprinkle 1 C. sugar and 1 pkg. of red Jello on top. Add one Jiffy cake mix over rhubarb mixture. Pour 1/3 C. of melted butter/margarine over top. Pour 1 C. of diet pop over top. Bake one hour at 350°. Note: The baking pan will be full when you place it in the oven so you may want to place a cookie sheet under it just in case it spills over the edge as it is baking.